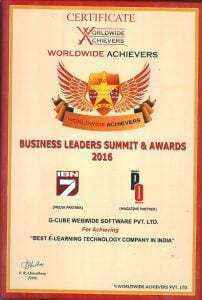 G-Cube received a coveted honour at the 6th Business Leader’s Summit, organized by Worldwide Achievers, a leading market research company. G-Cube was named as the ‘Best e-Learning Technology Company’ in India. Noida, India - G-Cube received a coveted honour at the 6th Business Leader’s Summit, organized by Worldwide Achievers, a leading market research company. G-Cube was named as the Best e-Learning Technology Company in India. G-Cube, in its more than a decade long tenure, has contributed to the e-learning industry through various experiences and across industries. The company has adapted and upgraded itself to meet the requirements of the industry and clients. The recognition is a testimonial to the acumen of G-Cube to provide high quality and the best solutions, all in one place — ranging from conceptualization to designing, and development to deployment, training and support. G-Cube is a leading CMMi Level 3 e-Learning products and services company, with a global delivery and support footprint. Over the last decade, G-Cube has helped hundreds of customers worldwide, and across diverse domains. G-Cube has the right mix of experience and expertise to provide company-specific solutions, instead of industry-specific solutions. The solutions are flexible to meet the ever evolving needs of the customers. G-Cube's product portfolio includes our cutting edge WiZDOM Learning Suite, which comprises of LMS, Virtual Class Room, Content Authoring Tool, Assessment Engine, and Skill Gap and ILT management systems. G-Cube has won various industry awards, such as the Deloitte Tech Fast 50 India Award for the last four consecutive years, multiple Brandon Hall Awards for Excellence in Learning and Technology, the NASSCOM Emerge 50 Award, and the Apex Award for Publishing Excellence.